There has been plenty of proverbial ink spilled over how difficult it will be for President Donald Trump to undo or amend many of President Obama’s signature regulatory achievements. Indeed, regulations like the Volcker Rule and the Clean Power Plan will take years to revise or reverse, but there should also be a focus on the incredible power a president can wield with a “pen and phone.” On Day One, President Trump will be able to impose a regulatory moratorium, direct significant changes to regulatory procedure via an informal regulatory budget, alter benefit-cost analysis, and perhaps even rein in independent agencies. Strengthening the staff and the role at the Office of Information and Regulatory Affairs (OIRA) could focus these efforts and bolster the regulatory modernization posture of the Trump Administration. At first blush, this might be viewed as a radical step, but the Obama Administration also implemented a temporary moratorium in 2009. 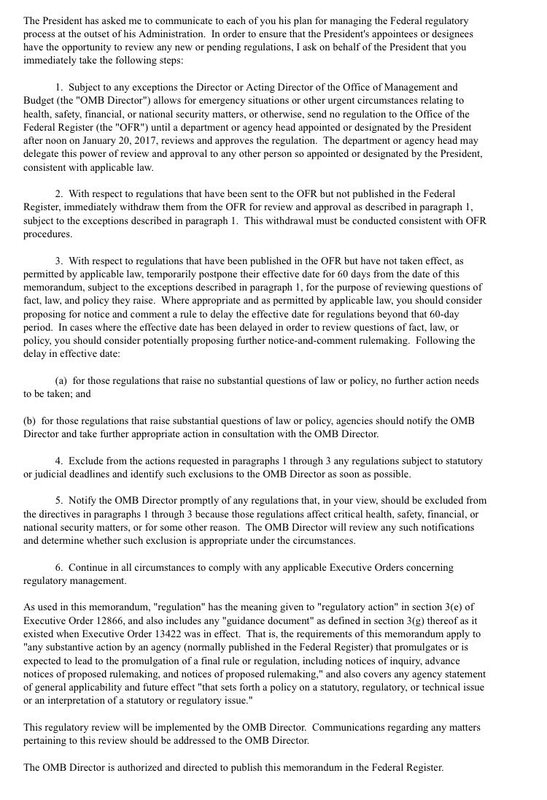 On January 20, then-Chief of Staff Rahm Emanuel directed all agencies to refrain from sending proposed or final regulations to the Federal Register for publication. In addition, any rules that had been sent, but not yet published, were to be withdrawn. Finally, the memo suggested extending the effective date of rules that had been published. This de facto regulatory moratorium resulted in no final major regulations approved by the new administration until March 6. For those who view a moratorium as extreme, several states have implemented longer moratoria without significant impacts on health and safety. In 2014, the American Action Forum (AAF) found an average state implementing a moratorium gained 15,600 jobs, created 2,800 new small businesses, and increased wages by $129 million per quarter. This evidence should bolster, not distract from a temporary regulatory moratorium on the federal level. This break will give the incoming Trump Administration an opportunity to oversee what is in the regulatory pipeline. For example, there are currently 27 rulemakings pending review at OIRA and seven “economically significant” regulations (measures with an economic impact of $100 million or more), including drone rules and new energy efficiency standards for housing. Once the moratorium is implemented, the incoming OIRA team will review the current slate of pending regulations and identify any recent rules as candidates for an extended effective date. Given a regulatory output of 3,000 to 4,000 rules annually, President Trump’s moratorium will offer a brief instance to “catch its breath” and account for the scope and magnitude of the current regulatory state. In one of President-elect Trump’s first statements after the election, he outlined his views for a regulatory budget in the U.S. He noted, “I will formulate a rule, which says that for every one new regulation, two old regulations must be eliminated.” There will need to be further details on this proposal, but as AAF has outlined in the past, regulatory budgets in Canada and the United Kingdom have not resulted in significant adverse health and safety consequences. On Day One, President Trump could issue an executive order outlining his plan for a regulatory budget on a federal level. To start, as AAF has suggested before, the administration could implement an administrative or paperwork budget. A full regulatory budget, applying to future and all past rules, will take time to evaluate the cumulative stock of federal rules. However, with administrative costs, there is already an accounting of requirements. Currently, the federal government has 9,431 active “OMB Control Numbers,” such as the U.S. Income Tax and the I-9 immigration form. The hourly burdens and quantitative costs of these requirements are known with some accuracy, although there are notable exceptions. There would be no massive investment of resources to conduct a retrospective review of each agency’s paperwork stock. Although a paperwork budget offers the quickest implementation path to a regulatory budget, perhaps on Day One, it is also the most limited in scope. At minimum, it could serve as a placeholder for reform and actually generate some immediate savings for businesses. With several regulations likely to be repealed through the Congressional Review Act (CRA), it could give the administration an early start on regulatory budgeting. After the implementation of a paperwork budget, and once these resolutions of disapproval under the CRA have been passed, the administration can formulate the specifics of a one-in-two-out system. A flexible budget that can amend past rules and use savings from CRA measures will already have a strong start toward full implementation. In addition to explicating his vision for regulatory modernization through executive order, President Trump will have the power to amend “OMB Circular A-4.” This little-know guidance to executive agencies provides instructions on conducting regulatory analysis, including costs, benefits, and discount rates. As AAF has detailed in the past, arcane issues like discount rates can have a profound impact in determining whether to issue new federal rules. During the Obama Administration, conservatives and libertarians took issue with several aspects of regulatory analysis, including: 1) discount rates, 2) public versus private benefits, 3) domestic versus international benefits, 4) co-benefits, stemming mainly from environmental regulations, and 5) the Social Cost of Carbon (SCC). Discount rates and SCC are related, but inter-agency work could also change the value of the SCC in the future. Regardless of whether the discount rate or value of the SCC is changed, using more dynamic discount rates to reflect consumer preferences could better inform regulatory decision-making. Public and private benefits are most pronounced for energy efficiency standards, and as AAF and others have noted, many Department of Energy (DOE) regulations are only justified on a benefit-cost basis if regulators assume that forcing consumers to buy more efficient products generates national benefits. Using greenhouse gas savings and environmental benefits would not be enough to justify many automobile and energy efficiency regulations. The issue of domestic versus international benefits is concentrated mostly in environmental regulation, but regulators often tilt the balance of some regulation by using international benefits even though a vast majority of the costs are borne by Americans. This issue also affects the SCC, but a revision to Circular A-4 could clarify or amend how regulators treat international costs and benefits. For instance, international costs are typically discussed, but often excluded from most analyses now. Finally, co-benefits have received plenty of attention for possibly inflating benefit figures. For instance, EPA’s regulation of mercury emissions generated $6 million in direct benefits, but produced billions of dollars in co-benefits by reducing an unrelated pollutant (PM2.5), even though the concentration of that unrelated pollutant was already within statutory standards. According to the GW Regulatory Studies Center, “Ninety-nine percent of the estimated benefits of the MATS rule derived from co-benefits associated with ancillary reductions in PM2.5.” Co-benefits also take center-stage with some DOE rules, but again, a revision of Circular A-4 could clarify the role of these benefits in the future. This could be achieved during the first few days of the next administration. With Members of Congress eager to remove Consumer Financial Protection Bureau (CFPB) Director Richard Cordray, oversight of independent agencies could change drastically in 2016. After a court opinion ruled the structure of CFPB unconstitutional, pending appeal, the agency is now more of a cabinet department than a true “independent agency.” In addition to possibly dismissing Director Cordray, President Trump could place CFPB under OIRA review, apply Circular A-4 and applicable executive orders, and scrutinize the major regulations from the agency. CFPB would no longer be one of the “fastest” agencies to regulate in the federal government, nor one of the most opaque regarding quantifying costs. Furthermore, there are strong arguments to persuade President Trump to extend his executive orders on regulatory review to independent agencies. It makes little sense to have half of federal regulators operating under one set of rules and the other half under another. There is strong evidence that OIRA review can improve the quality of regulatory analysis, and likely the policy outcomes as well. Although extending executive orders and OIRA review would prove controversial, and could even provoke lawsuits, it would provide an equal regulatory process for all federal rules and likely lead to a greater understanding about the consequences of independent agency action. All of the reforms above could be implemented during the first few days or weeks of the Trump Administration. However, leadership begins at the top, and a strong and fully-staffed OIRA will be central to regulatory modernization efforts. If independent agencies begin to submit regulations to OIRA, the office’s scope and staff will need to be increased in the future. Whether it is developing executive orders, reviewing and scrutinizing pending rules, or implementing new guidance for future rulemakings, OIRA’s role is critical to the next administration.